March 2012 - New York - Based on the iconic trading cards, Mars Attacks, that forever changed the face of science fiction. 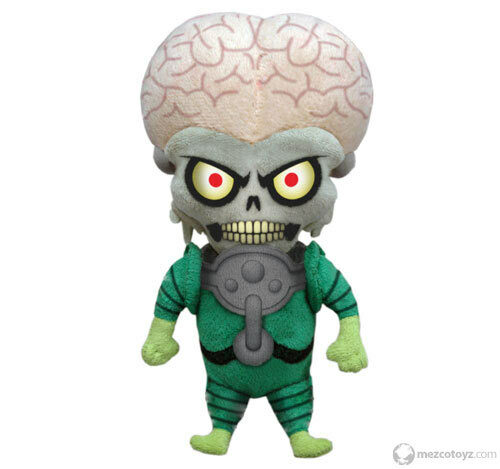 Mezco brings these Martians to life with this 8inch scale plush figure. The other-worldly creation features the Martian's signature exposed oversized brain and bulbous eyes, along with the iconic green spacesuit. "...totally nailed the detail in their brain-like head..." wrote Kastors Korner, "The cuddliest alien I've ever seen! He's invaded my heart!!" says Eric Resnik of YouBentMyWookie.